Home Hawaii What’s beneath Hawaii’s most active volcano? Step away from the villages and idyllic beaches of Hawaii, and you may think you’ve been transported to the moon. Walking along the lava flows of the Kilauea volcano, the landscape changes from a lush tropical paradise to one that’s bleak and desolate, the ground gray and rippled with hardened lava. That’s how Christelle Wauthier, assistant professor in the Department of Geosciences and the Institute for CyberScience at Penn State, describes it, anyway. Wauthier has been studying Kilauea volcano for several years and is getting ready to start a new project at Penn State—one using a radar imaging technique that researchers call interferometric synthetic aperture radar (InSAR) to try to peer below its surface and learn more about why the volcano is so volatile. Kilauea is the most active of the five volcanoes that make up the island of Hawaii. It’s been erupting continuously since 1983, so far spewing 3.5 cubic kilometers of lava onto the surrounding landscape. The lava usually flows southward, but last year an eruption started creeping east toward the nearby village of Pahoa. The flow was inconsistent—advancing anywhere from 10 yards to one-quarter mile a day—but it was enough to cause evacuations and lots of anxiety for the residents of the small village. Wauthier says the volcano’s recent brush with the island’s inhabitants reinforced the importance of studying not just what’s happening on the surface of the volcano, but also what’s going on below. One of the keys to answering this question is found in the deformations happening on the surface of Kilauea. While a deformation is simply a change on the volcano’s exterior, what it implies goes much deeper—there has to be something below the surface causing the change. And without X-ray glasses to diagnose what’s happening, Wauthier uses InSAR to try to piece together what might be going on. To begin the process, Wauthier gathers satellite data from archived databases. She looks for information about changes in elevation from before and after a “natural hazard event”—an eruption or earthquake, for example. Wauthier then uses this data to create two images: one from before the natural hazard event and one from after. This shows how the event changed the ground’s surface. The two pictures can then be combined to create a single, much more comprehensive InSAR image called an interferogram, which uses color to represent movement. Wauthier says that while InSAR images can certainly be created from two images, she also uses a time-series approach called Multi-Temporal (MT)-InSAR when enough radar images are available. This technique uses multiple images instead of two. After Wauthier creates the InSAR images, she can begin to use them to predict what might be happening underneath Kilauea. She uses an approach called inverse modeling to estimate what caused the deformation. But magma processes aren’t the only things that could be affecting Kilauea’s volatility. 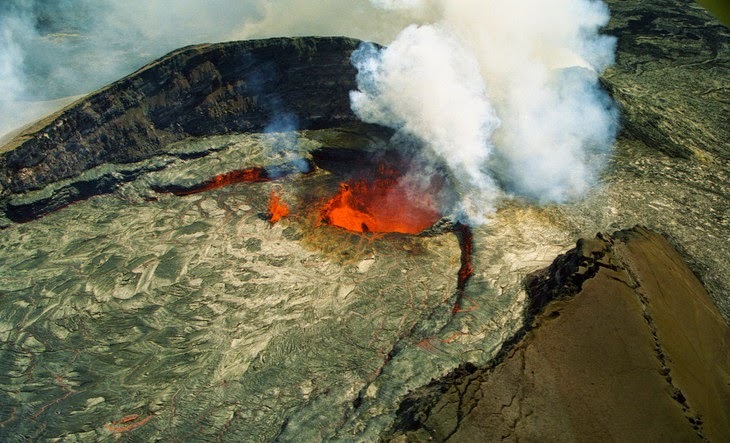 The southern flank of the volcano is moving away from the island, and Wauthier says this could also be influencing the volcano’s magma plumbing system and activity. Wauthier says that although the flank is slipping seaward at an average speed of 6 to 10 centimeters a year, earthquakes in the past have caused more drastic movement and have even generated tsunamis. Wauthier says she would like to return to Hawaii one day, but in the meantime, she hopes the project will help uncover information that could help the people of Hawaii as well as other scientists at the U.S. Geological Society Hawaiian Volcano Observatory. Having a better understanding of Kilauea would help researchers better grasp the behavior of other ocean islands volcanoes. Note : The above story is based on materials provided by Pennsylvania State University.